The black Labradoodle is a popular crossbreed choice for many families looking for a family pet as well as those in need of an intelligent and sociable service dog. This color especially has been gaining a lot of traction amongst breeders and dog lovers alike. But what is it that makes the black Labradoodle so different from his other Labradoodle counterparts? 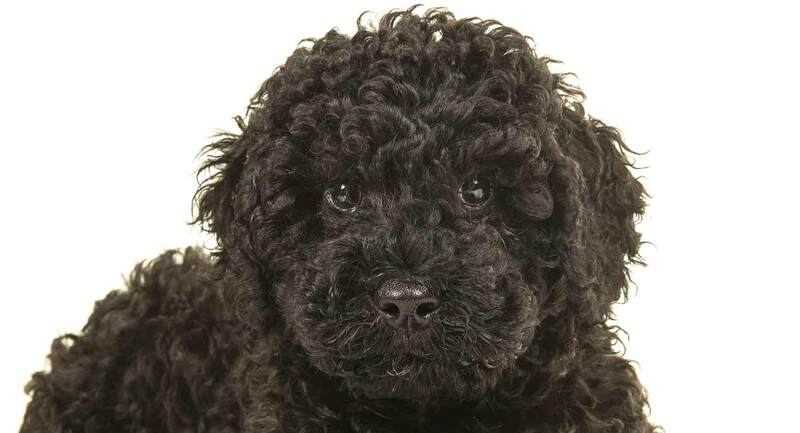 What Is a Black Labradoodle? The Labradoodle is a crossbreed between the purebred poodle and the Labrador retriever, and the black Labradoodle is therefore exactly what he sounds like he is—a Labradoodle that is black. A lot comes into play when breeders attempt to create a black Labradoodle. 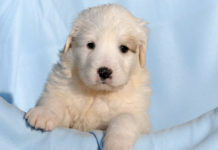 That is because both the purebred Labrador retriever and the purebred poodle come in three different color varieties. Genetics are difficult to control, and sometimes it takes a few generations for breeders to get the desired color of a Labradoodle right. Especially when working with an F1 black Labradoodle (a first-generation Labradoodle crossbreed). For the most part, though, the puppy’s parents are going to be the standard black poodle and the black Labrador retriever. 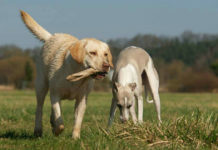 You can learn more about genetics and coat color in dogs here. But how did the Labradoodle come to be in the first place, and is there a difference between the black Labradoodle and the black Australian Labradoodle? The Labradoodle craze is believed to have begun in Australia, where enthusiastic breeders went on a mission to create an intelligent, friendly and responsive service dog that had all the desirable traits of the poodle and the Lab. Still, because the Labradoodle is a newer generation crossbreed, there is a lot of speculation regarding the majority of his roots. To learn as much as we can about the black Labradoodle and his origin, let’s take a look at the origin of his parent breeds. The Labrador is an ancient breed who hails from Newfoundland, Canada. The poodle is of German descent and is believed to be over 400 years old. Both breeds were used as waterdogs for fishing and duck hunting, and were renowned for their intelligence and retrieving abilities. So, considering their high level of intelligence, their incredible loyalty and athletic charisma. It’s no wonder Australian breeders thought these two would make a wonderful crossbreed offspring. But what does the black Labradoodle look like if it is a mix between the Lab and the poodle? How Big Is a Black Labradoodle? An adult Labradoodle size is going to depend on several factors. Because he is a crossbreed, your Labradoodle full grown will vary in size based not only on which genetic traits he inherits from his purebred parents, but also how big each parent breed is. Labradors, for example, are typically between 21 and 24.5 inches tall, and can weigh 55 to 80 pounds, with females usually on the smaller end of the scale. The standard poodle, on the other hand, is typically over 15 inches tall and weighs anywhere from 40 to 70 pounds. Therefore, getting a medium black Labradoodle or a large black Labradoodle will depend on the size of its parent breeds. However, on average, the black standard Labradoodle is around 15 to 24.5 inches tall and will weigh between 40 and 80 pounds. Just about the only thing you can guarantee about what your black Labradoodle will look like will be his color. This is because he is a crossbreed. For that reason, his coat texture, size, weight and more will be left up to chance. 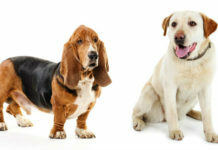 Despite having similar temperamental traits, the poodle and the Labrador are very different looking dogs. The Labrador has a sleek, thick coat that sheds while the poodle’s coat hardly sheds at all, is much curlier and is quite dense. Both the Labrador and the poodle come in three color varieties. The Lab, for example, comes in chocolate, black and yellow, while the poodle comes in black, brown and apricot. Both breeds are athletically built water dogs, however, so a prospective black Labradoodle owner can expect this crossbreed to be similarly built, with a long tail, floppy ears, and a sweet, expressive face. As we have mentioned before, because the black Labradoodle is a crossbreed, the aspects of his coat type are going to be left up to chance and genetics. Keep in mind that while the poodle is considered to be a hypoallergenic dog who hardly sheds and produces very little allergy-inducing dander in his coat, the Labrador sheds heavier twice a year during shedding season. For this reason, grooming maintenance could vary when it comes to your black Labradoodle mix. If you get aspects of the Labrador’s coat in your black Labradoodle crossbreed, you may want to brush him about twice a week with a metal comb and slicker brush to keep loose hair under control. On the other hand, if the black Labradoodle has a coat more like his poodle parent, his fur could be prone to matting and will need brushing a bit more frequently. The black Labradoodle’s coat shouldn’t be too difficult to keep clean. And due to the dark color, you won’t need to worry about tear stains. However, your black Labradoodle will need an occasional bath every few weeks. He will also need his nails trimmed regularly to keep them from breaking and his ears cleaned to keep them from developing infection due to waxy build up. Since the black Labradoodle is a crossbreed, he can be prone to many of the same genetic health concerns as his purebred parents. 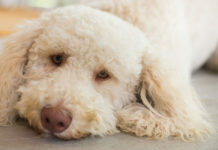 For instance, the poodle has a life span of 10 to 18 years and can be prone to Addison’s Disease, hip dysplasia, epilepsy, thyroid issues, progressive retinal atrophy, bloat and hypoglycemia. The Labrador has a life expectancy of about 10 to 12 years. This dog can be prone to hip and elbow dysplasia, retinal dysplasia, cataracts, progressive retinal atrophy, epilepsy, circulatory system issues, pulmonic stenosis, tricuspid valve dysplasia, endocrine diseases, hypothyroidism, diabetes, hereditary myopathy and bloat. Because the black Labradoodle can be prone to so many of the same health concerns as his purebred parents, we suggest early health screening in your black Labradoodle puppy. Early health screening can help you to better understand and prepare for any of the above-named health concerns of a black Labradoodle crossbreed. We should keep in mind that a healthy lifestyle and proper diet will also play a big part in the health of your black Labradoodle. For a list of high-quality dog foods that we love for the Labradoodle, visit us here. Does the Black Labradoodle Temperament Differ from Other Labradoodles? There are those who claim that black Labradoodle’s behave differently than other colored Labradoodles, but these are claims based mostly on biased and superstitions, with little to no evidence supporting them. Truth be told, a black Labradoodle is still just a Labradoodle, and he will carry whichever temperamental traits he inherits from his purebred parents. As previously mentioned, the Labrador and the poodle have very similar temperamental traits. They are both family-oriented breeds who do well with children and are incredibly intelligent. However, they are also both highly energetic and athletic. For this reason, a black Labradoodle will more likely than not require a lot of time and patience when it comes to training and exercise. Since the black Labradoodle is the crossbreed offspring of two very intelligent and active breeds, he could be prone to boredom and becoming destructive if left to his own devices without doggy jobs or activates. For this reason, we recommend early socialization and obedience training beginning in puppyhood to ensure the black Labradoodle is a well-adjusted and happy dog. Can You Show a Black Labradoodle? While the black Labradoodle makes an excellent family pet and service animal when properly trained and socialized, he is a newer generation crossbreed and is still not officially recognized by official clubs and organizations, like the American Kennel Club, for example. For those interested in show dogs, purebreds are the best and safest bet. Still, there are purebred standards that dogs used for show require. To learn more about breed standards for show dogs, you can visit AKC.org. 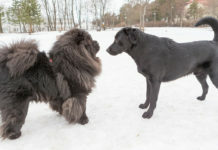 Both the Labrador retriever and the poodle are active, intelligent, and highly energetic dogs, meaning their black Labradoodle offspring is likely going to be similar. A dog with smarts and energy will require a lot of exercise, so anyone considering getting a black Labradoodle crossbreed should prepare to spend an adequate amount of time every day providing this dog with what he needs to be happy and healthy. But what kind of exercise does the black Labradoodle require? Daily walks, jogs, hikes and swimming can all serve as excellent exercise outlets for your black Labradoodle crossbreed. Your black Labradoodle will also enjoy games of fetch, chase, and Frisbee in a large, fenced-in backyard. Keep in mind that the black Labradoodle is the crossbreed offspring of two dogs who were bred for hunting, and he should, therefore, be walked on a leash whenever outside of the home. Chances are he won’t be able to resist chasing after that squirrel or rabbit, even if it leads him toward a busy road. The Labrador and the poodle are both very smart breeds, but with intelligence comes independent thinking. For the most part, the Lab and the poodle are eager to please and make loyal, hard-working students, so long as the training sessions are kept fun, positive and rewarding for them. 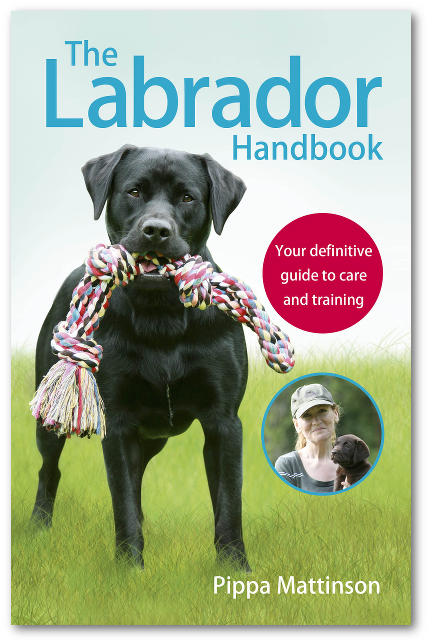 This means that your black Labradoodle should be simple to train. 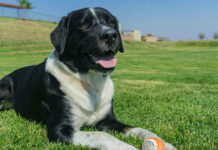 Of course, he can be a sensitive crossbreed and will want to make you proud, so we recommend staying away from punishments or scoldings and gear toward positive reinforcement and the treat-based reward system. Should I Get a Black Labradoodle? The black Labradoodle is quite a popular crossbreed these days, but that doesn’t mean he is the dog for everyone. Black Labradoodles are still Labradoodles. A prospective owner should note that this crossbreed is intelligent, but also energetic. He could be a lot to handle for the novice dog owner who is not used to having a dog around all the time. However, if you live an active lifestyle and are able to groom, exercise and train your black Labradoodle properly, then he may make the perfect pet for you. He does well with children of all ages. However, he is not recommended for those looking for a calm dog who just wants to laze about all day. The black Labradoodle is a go-getter who will need doggy jobs and training to stay happy and healthy. If you think the Labradoodle is right for you, keep reading because we have tips on how to find the healthiest puppy possible. Always do your research and make sure that when going through a black labradoodle breeder, they are trustworthy and responsible. Responsible breeding practices can make all the difference when considering the health of your black Labradoodle crossbreed. Furthermore, most reputable breeders of the black Labradoodle are aware of the health implications of the crossbreed and will have already health screened their litters. Don’t be afraid to ask for the certificates proving your breeder’s dogs have been cleared and are healthy and ready to go home. The price of black Labradoodle puppies through a breeder can vary but are usually in the range of $500 to more than $1000. Are you the proud owner of a black Labradoodle crossbreed? Let us know in the comments. Previous articleAkita Lab Mix: Great Guard Dog or Fabulous Family Pet? Next articleCan Dogs Get Chicken Pox or Is It a Human Disease Only? We got our black labradoodle 8 mos ago and she just turned 1 last month. She is a great dog and very affectionate. She has a fleece coat and is standard size at 60 lbs. Best decison for a puppy we could make for us.